Kendall Williams was deemed a major prospect very early on in his high school career, being offered a scholarship from hometown UCLA already after his freshman year. He accepted that scholarship and remained committed for much of high school, but saw his stock drop significantly in the eyes of the recruiting services and ended up parting ways with UCLA when he realized the interest in him had cooled significantly. Williams ended up at New Mexico, where he became an instant contributor, playing 30 minutes per game in each of his first seasons and developing into an All-Conference player as a sophomore after winning freshman of the year honors. Now a junior, he'll be expected to take the next step as a collegiate and pro prospect as one of the leaders of a team off to an outstanding 4-0 start to the 2012-2013 campaign, with wins over Davidson, George Mason and UConn. Williams has excellent size for a point guard at 6-4, with a wiry frame that still needs to fill out. He's a good athlete on top of that, showing outstanding speed in the open court, and the ability to make plays above the rim. Williams shows a very good feel for running an offense and getting teammates involved, as he's an unselfish player with a high basketball IQ. His size allows him to see over the top of opponents, and he shows very nice timing drawing defenders and then making the extra pass to cutters at the rim or shooters spotting up outside, playing at a very unique pace. New Mexico's primary ball-handler in isolation and pick and roll situations, Williams is still figuring out how to blend his scoring and passing game efficiently at this stage. He struggled to finish at a high rate around the basket in the half-court last season, making just 21 of 55 attempts. Not possessing the most explosive first step around, he can still stand to improve upon his advanced ball-handling skills and ability to change speeds and get all the way to the rim, as he tends to take a lot of tough-angled layups from just outside the paint or floaters from 5-7 feet out. Getting stronger and better at finishing with his left hand will help here, but he showed decent flashes in this area at times last season, particularly in his ability to get to the free throw line. Williams has been a solid shooter since he stepped on campus, making 43% of his 3-point attempts as a freshman and then 36% last year. He doesn't possess the most conventional mechanics, but he's a confident and proficient shot-maker who is capable of hitting with his feet set or off the dribble, and has already made a number of very important shots for New Mexico late in games. This allows him to see some minutes playing off the ball as well in different lineups and half-court sets, which gives his team some added versatility. It will be interesting to see how he shoots the ball this season now that he'll likely be asked to carry a heavier scoring load. On the other end of the floor, Williams is a very capable option as well. He puts a very good effort in defensively, doing a good job getting in a low stance and working hard to keep opponents out of the lane and contest shots with his length. His excellent size gives him the ability to guard multiple positions, and that coupled with his strong anticipation skills and aggressiveness allows him to get in the passing lanes on a regular basis. While perhaps not the quickest player laterally, or the strongest fighting over screens, Williams' size, high basketball IQ, competitiveness are major assets. A fairly unconventional player, Williams has some very interesting strengths to build on with his excellent size and playmaking skills. 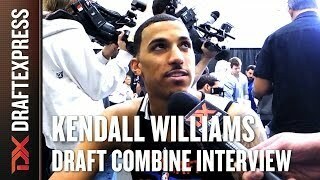 After losing one of the best players in the conference in Drew Gordon, the Lobos will likely need Kendall Williams (and teammate Tony Snell) to have a big year if they are to make the NCAA Tournament once again, which should help him gain more notoriety on the national level and draw some more attention from NBA decision makers. Based on what we've seen in the early going, Williams is poised to have a breakout season.